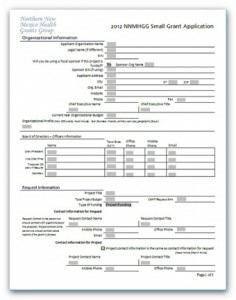 The 2012 NNMHGG Grant Application form is a Word 2003 document that should be easily compatible with newer versions of Word or Open Office Writer. When you first open the document you may need to click “yes” to enable the macros that run drop-down selections. If you have any problems downloading, opening, or using the form contact Cecile LaBore, Information Manager. You may email or phone 505-438-0776, ext. 5.